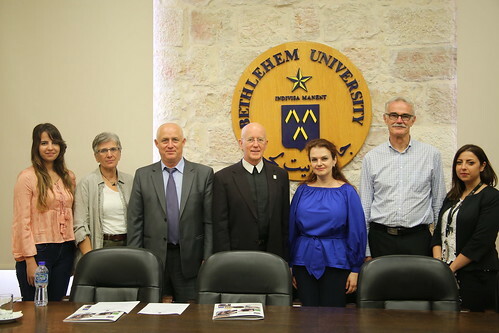 On Tuesday, 12 June 2018, Bethlehem University welcomed H.E. Mrs. Myroslava Shcherbatyuk, Director-General for the Middle East and Africa, Ministry of Foreign Affairs of the Ukraine. Joining her was H.E. Mr. Mykola Leschenko, Ambassador of Ukraine to Palestine. The visitors were welcomed by Brother Peter Bray, Vice Chancellor, Dr. Irene Hazou, Academic Vice President, Brother Denis Loft, Vice President for Advancement, Mr. Isaac Sahhar, Assistant Vice President for Advancement, and Ms. Amjaad Musleh, Guest Relations Officer. Brother Peter explained the reason Bethlehem University exists was the students. He also briefed the guests on the background and some statistics of the university. Mrs. Shcherbatyuk was recently appointed Director-General. She was keen on knowing more about Bethlehem University and exploring ways in which the two sides could cooperate.